You are here: Home » So just what is this Apple TV thing…. 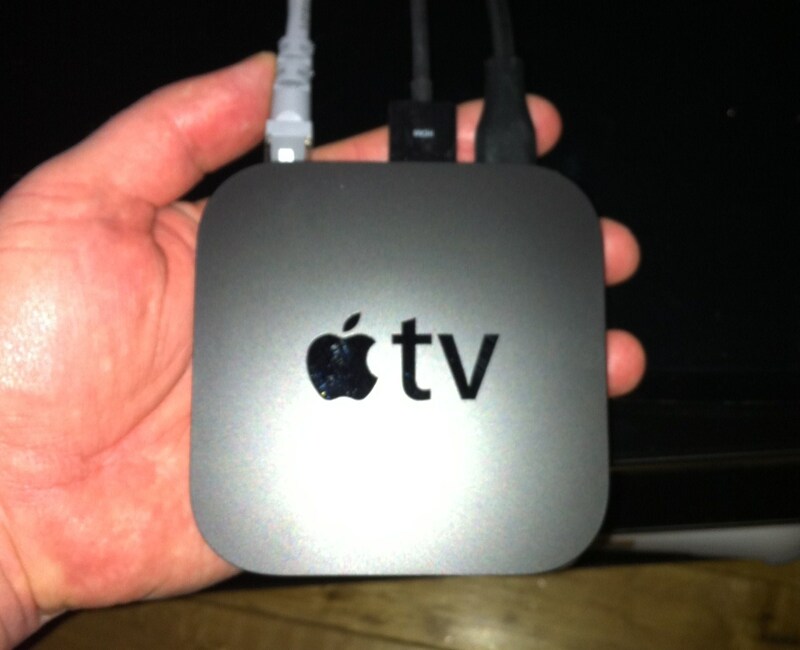 So just what is this Apple TV thing…. Its fast, easy to use, links up to iPhones, iPads, computers. We can play our music on it from any of our iTunes accounts using the home sharing facility in iTunes. We can watch\browse YouTube or Flickr. We can rent movies on it. They stream to the device via the internet and are immediately(within 30 secs!) available to play. No more driving the 5 km to Xtravision and back for us. Movie rentals on it are cheaper than DVD or Blu-Ray rentals. It’ll save us money in the long-term as we normally rent at least 1 movie every week. I can buy movies or series on iTunes and watch on the TV easily. Its HD. It’s very small (roughly 10cm x 10cm x 2.5cm – see pic). Its wireless. I can control it from my iPhone or iPad (Yes there’s an app for that!) but it also has its own remote so iPhone\iPad not needed. I can stream content from my apple devices to the Apple TV via Airplay e.g. On my iPhone I recorded the kids playing. I play it on my iPhone and hit the Airplay button and it appears on my TV. Simple. It’s very very easy to use. Rumored that more features such as Safari are coming with later software releases. And did I say its easy to use? For me its the missing link with the whole Apple personal devices\ home entertainment piece. It brings them all together seamlessly. It’s the best piece of home tech and value for money from 2010. Honest! Note: OK so I spouted off on its wonders. Yes there are some things that could be better(maybe they will come in the future here?). We dont have the same options as in the states such as Netflix so we need an iTunes account and if they could add the RTE and TV3 (and BBC!) online players it would really enhance it and make it appealing for this market and even the must have home entertainment device. Will it play other formats of the network? I have lots of xvids, divx etc which I made from the kids DVDs and stuck on a Nas ? We use Windows Media Center for every thing in the living room and its great. I’m very curious about the apple tv device. Kevin, here is a couple of pieces from the apple site…. If you can’t add or play a movie in iTunes or QuickTime Player, then you won’t be able to convert it to play on Apple TV. Some examples of movies you can’t add or play include WMV, AVI, DivX, RealMedia (rm), and Flash format files. Some third-party utilities may be able to convert these types of movies to a format compatible with iTunes and Apple TV. H.264 is the base format, but see this page for more detailed specifications of the compatible video formats.